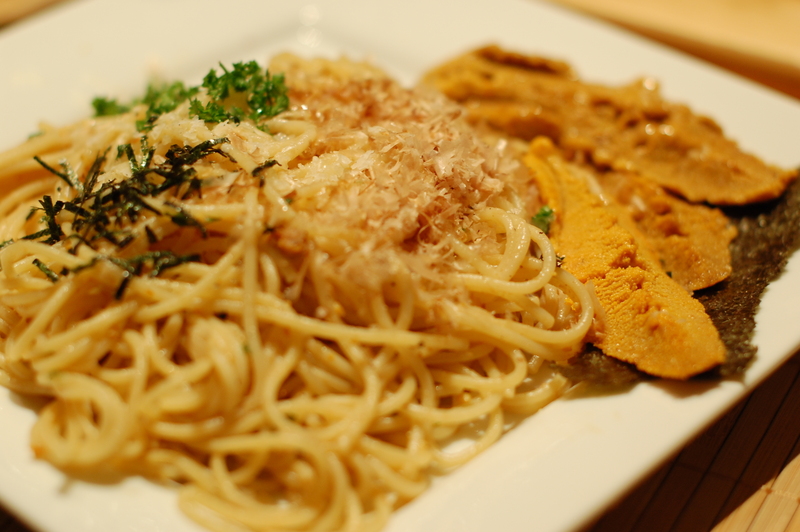 My husband cannot forget the taste of the uni pasta from Cafe Hiro when we visited LA a few years ago. We bought fresh sea urchins, and I searched internet for the very few recipes that may look promising and combined all the ingredients to come up with this version. It’s not even 70% like the one we had from LA. Anyways, it’s a good enough homemade uni pasta recipe to share. 1. Bring a medium pot of water to a boil over high heat. Meanwhile, in a skillet large enough to hold pasta later on, heat olive oil over medium heat. Add shallots, heat for 2 minutes, then add garlic till brown. 2. Add chili flakes and simmer for around a minute. Deglaze with sake. Add tomatoes (face down) or mushroom, cook until just wilted and stir gently. 4. Turn heat under skillet to low. Add uni pasta sauce. Add about 3/4 of the tray of sea urchin to skillet with a sprinkle of salt. Add cream to thicken. Add pasta to skillet and toss thoroughly but gently over low heat, adding pasta cooking water and more oil to taste if mixture is dry. Season with salt and a bit of black pepper. Then add parmesan cheese, and parsley. Serve hot, decorating each serving with remaining sea urchin and top with dried shredded seaweed and bonita flakes. where did u get the uni pasta sauce? I got it from Asia (Hong Kong) in a store called MUJI that’s originated from Japan. It’s just a small package (like 15-30 gm) uni cream MSG to enhance favor. I haven’t seen such thing in North America. So if you are buying fresh sea urchin, the taste should be intense enough if you add enough fresh uni to the paste so the sauce can be omitted.